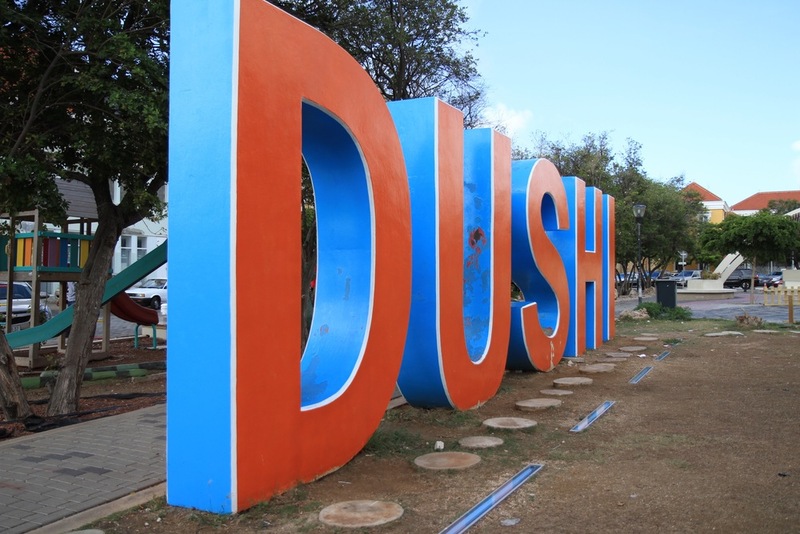 From blogger and globetrotter, Nubia DuVall Wilson, read on for everything you need to know about the colorful Dutch Caribbean island of Curaçao before your next trip. Part of the Dutch ABC islands, Curaçao has long been overshadowed by its more popular sister Aruba, but that's all to change thanks to new direct flights from JetBlue. Queen Emma Bridge. All photos courtesy Christopher J Wilson. Numerous airlines fly to Curaçao via Miami. In 2015, JetBlue was the first airline to offer non-stop flights and they are adding another flight in 2016, by popular demand. My two-year-old daughter loved having her own TV on JetBlue, which kept her entertained during the entire four-hour flight. On the other hand, my 13-month-old son needed a little more attention, but luckily the plane was filled with little ones as Curaçao is very family friendly. When you arrive at the airport you’ll hear English, Spanish and the local language Papamiento spoken. Lulu’s taxi service picked us up with an infant seat and toddler seat already in the van, so we didn’t have to worry about bringing them on vacation. There’s no website, so call +5999 6902797 to arrange your transfer. Taxis only accept cash and it costs about 50 USD one-way to get to Willemstad from the airport (American dollars are taken and preferred everywhere, as well as all major credit cards). Other than calling for one, the best way to hail a cab is to go to a hotel, where there’s often a line of taxis waiting. Alternatively, the concierge at your hotel or villa can help. If, like we did, you need a full kitchen and separate rooms for your children, I recommend staying at a luxury apartment, such as La Maya Beach or The Strand of Curaçao. Located on Spanish Water beach, La Maya is the best choice for anyone after a resort vibe on an expansive stretch of sand, while the Strand is good for easy access to the UNESCO World Heritage site of Willemstad, less than 10 minutes away by taxi. The Strand set up our car transfers to and from the airport, delivered our pre-ordered groceries and wine (even diapers!) the day we arrived, and the property has a private pool and quiet beach. All Strand apartments are three bedrooms with a modern kitchen, three baths, walk-in closets, beach towels, TVs, and a huge balcony for views of the ocean and sunset at night. If you have older children, there are plenty of hotels to choose from, such as Santa Barbara Beach & Golf Resort, which is also part of the Preferred Family collection. A full-service resort (with all-inclusive options), the property is a sophisticated option for parents who want family-friendly offerings and upscale perks. In addition to the spa, golf course, tennis courts and four restaurants, family amenities include connecting rooms, cribs, car seats, the Arawak Kids Club, a kids splash zone at the pool, babysitting services, pool and beach toys, and even spa services for kids. If you decide to venture into Willemstad for a meal, don’t be surprised at the lack of high chairs at restaurants — many only have one. Despite this, even trendy eateries like St. Tropez Oceanclub’s restaurant (where you eat seaside next to sunbathers at the pool) welcome patrons with children. Its menu features tapas as well as full entrees. My kids enjoyed a cheese and ham panini with fries, while my husband and I drank white wine and watched the cruise ships go by. Some places close after lunch and reopen for dinner at 6 p.m., such as Kome (Papamiento for ‘eat’), a popular restaurant owned by Americans in the historic Pietermaii District (just down the street from St. Tropez). Dishes are influenced by American, Caribbean, French, and Asian cuisines. 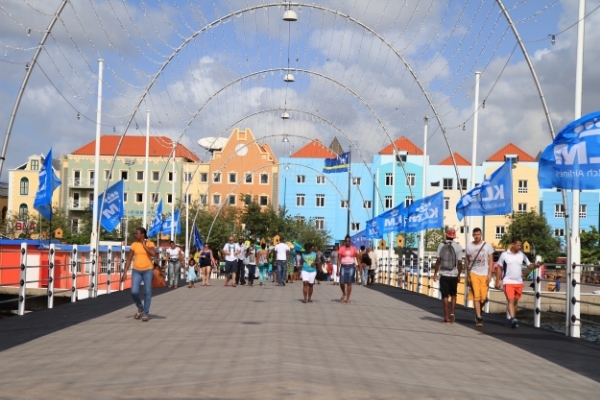 The heart of downtown Willemstad is divided into two sections, Punda and Otrabunda (‘other side’), by St. Anna Bay. In Punda, you can eat along the bay at one of numerous restaurants with outdoor seating. If you want a more commercial dining experience, walk across the Queen Emma Bridge to Otrabunda and visit historic Rif Fort, which is now part of the Renaissance Rif Fort Mall complex. You’ll find plenty of restaurant options and luxe retail shops, including Don’s Ice Cream Shop, Curaçao Burger Bar, and CRU Steakhouse & Wine Bar on the second floor with great views of the ocean. Arts & Culture Curaçao has a sophisticated, flourishing art scene that’s best experienced at the island’s four major art galleries. Skip the souvenir stands along St. Anna Bay in Otrabonda and head to Gallery Alma Blou (Blue Soul) in the historic Landhuis Habaai building to pick up authentic folk art produced by local elders. This gallery also showcases ceramics and art from local artists and a café to enjoy light bites. Landhuis Bloemhof is a sprawling art space with indoor and outdoor showings that rotate throughout the year. A must-see is the large scale project Cathedral of Thorns by local Dutch artist Herman van Bergen who was inspired to create this eight-foot-tall masterpiece after September 11. The most recent addition to the art scene is Project 3 Gallery, which has a mini exhibit on the history of photography. There are 15 local artists currently on display, including the very talented ceramist Ellen Spijkstra, mixed media specialist Giovani Zanolino, and American-born artist, Tanya Haynes, whose known for her painted water scenes dubbed “h20scapes” . Island Activities Renting a car with infant and toddler seats is very reasonable and easy to do online before you arrive, or at the airport. Hotels can also arrange for car seats and deliver it to you directly. Drive around Curaçao to explore its 30+ beaches and beautiful natural sites. Playa Kenepa is a small popular cove with a very shallow beach and great snorkeling, around 50 minutes northwest of Willemstad. Cas Abao is also on the island’s northwest and offers facilities like chairs, kayaks, and snorkeling gear for rent. Parents will appreciate the restroom facilities and Daiquiri Bar restaurant. There’s an entrance fee of about $5.00 per car. Jan Thiel Beach is east of Willemstad and has a wading area, small water park, and restaurant. Take a guided tour of the 1,500-year-old cave drawings inside the Hato Caves that also feature unique stalagmite and stalactite shapes. Swim, snorkel or dive with dolphins at the Curaçao Sea Aquarium, which is next to family-friendly Mambo beach. For a fascinating history lesson, visit the oldest surviving synagogue in the Americas, Mikve Israel-Emanual Synagogue in Punda. Nubia DuVall Wilson blogs at Encounters with Nubia: My Take on Motherhood One Trip at a Time, where she shares her adventures being a mom of two and traveling — with and without them!